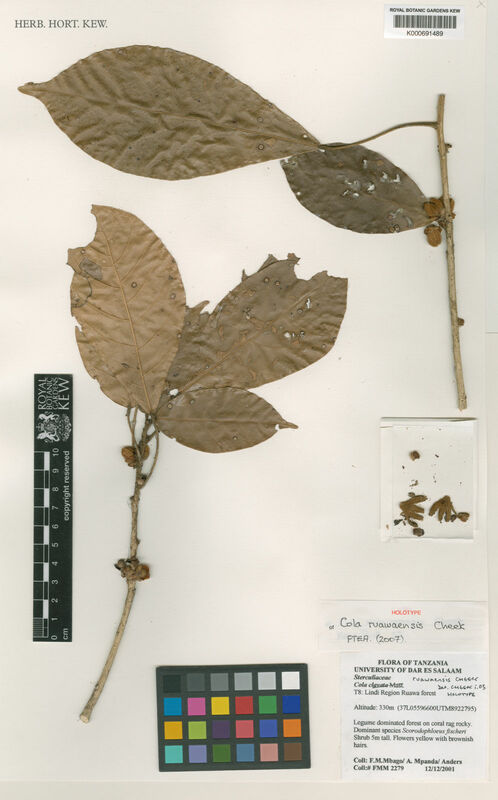 Cola ruawaensis is only known from the type locality. Ruawa forest is threatened by agricultural encroachment and illegal logging according to Clarke, P. (1995) Status Reports for 6 Coastal Forests in Lindi Region, Tanzania. Accordingly the taxon is here assessed as CR B2a,b(iii), critically endangered. 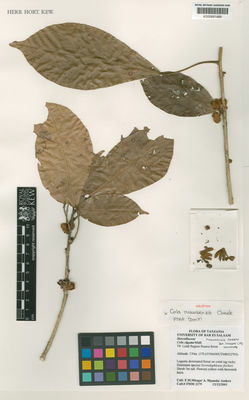 Cola ruawaensis is closely related to C. octoloboides of Kenya, also restricted to limestone, and only known from 1 or 2 sites. It differs in the non-persistent stipules, the deeply retuse (not rounded) bracts, the perianth divided to 7–8 mm from the base (not 2–5 mm), and the androphore with simple hairs (not stellate hairs). More collections are needed to complete our knowledge of the species.